Losing a HUGE shade tree this winter has presented some challenges to a few areas of the back garden. I've grappled with several design ideas. I've thought long and hard about what the overall best recourse would be to provide a little bit of relief to what used to be an area covered with shifting shade of the most refreshing sort. Other than creating the new 'circle garden' and installing plant materials that don't mind the hottest mid-day sun for a few hours it's been my aim to get something shade-growing sooner than later. And, admittedly, I've really struggled and resisted my constant urge to put in another live oak that would eventually create dense shade. It isn't anything new around here to put something in the ground to commemorate a particular event or to honor certain persons. Just one example being the four live oak trees in the back garden that are a continual reminder of how my three children grew up strong and courageous just as those trees did. The oaks were planted as thin-trunked seedlings only 6 feet tall in 1992. One in honor of each child and one for the ever-stalwart and longsuffering Mr. Meems. My family knows me well. I manage somehow to increase my plant inventory with each gift-receiving celebration day. Gardeners are good at that I think. So in celebration of this Mother's Day I was gifted with spending a leisurely morning this week sauntering through the garden center picking out some fun gardening assets. One of them was a blooming crape myrtle tree Lagerstroemia x 'Natchez'. I settled on a standard version with a single trunk. It blooms large plumes of white flowers when mature. This new one may actually produce some blooms in about a month if all goes well. A tree of the same variety with multi-trunks can be seen in the background standing a solid 20 feet tall. I planted the new one at an entrance to the circle garden pathway. (And just on the other side of where the large 'old drake elm' stump is still preventing me from digging.) The crape won't get as big as the elm. But being a fairly fast grower it should soon add some much needed filtered shade in that area at just the right height and width not to interfere with existing trees. Not a big fan of canna flowers I snipped these off of the attractive leaves just after these photos. The brilliantly hued, tropical leaves are why I plant them. They shall stay. 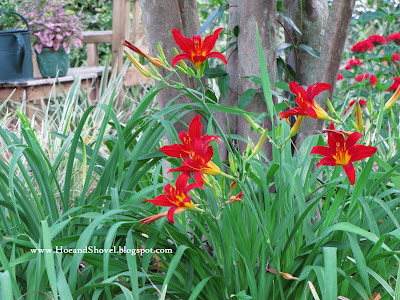 The day lilies that usually bloom in March have only recently started flushing out. 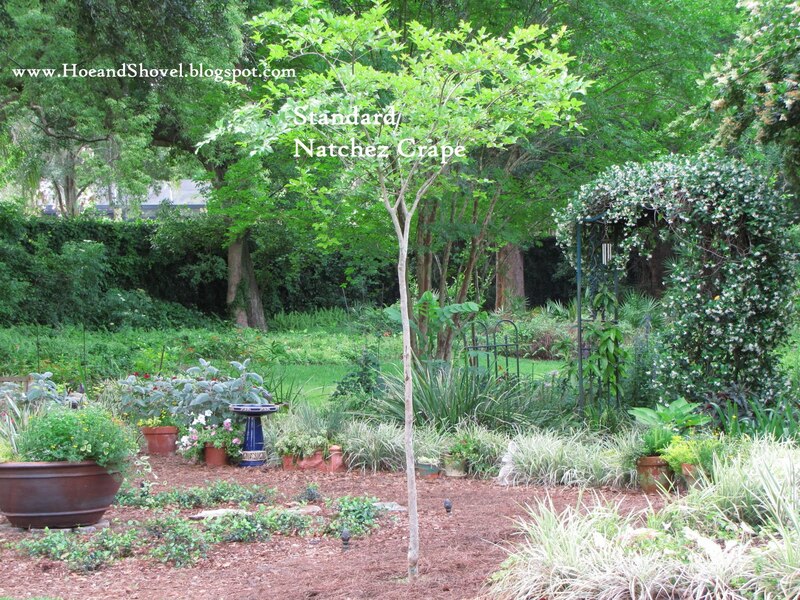 All are situated at the base of the multi-trunked Natchez Crape Myrtle. Happy Mother's Day to all the hard working moms! 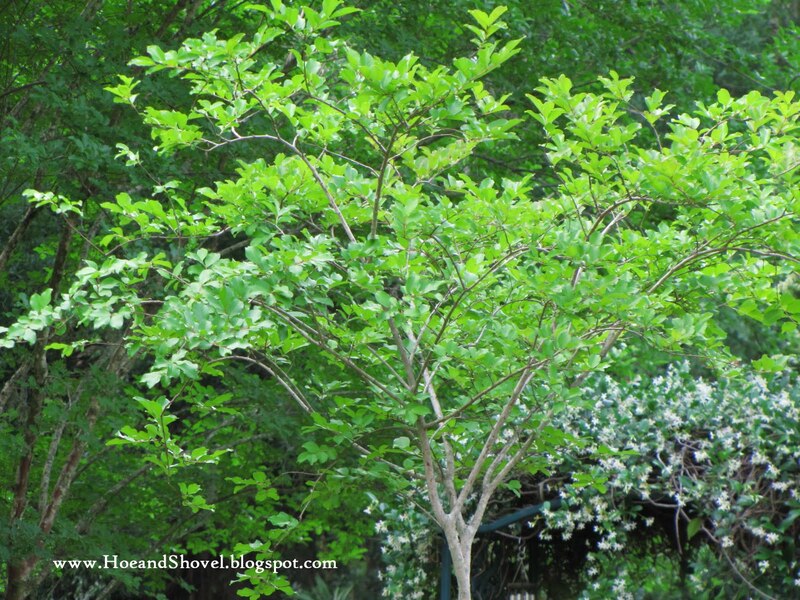 Will your crape myrtle tree lose the leaves in the winter? My garden also needs something for afternoon shade, but since it doesn't have much space, I am struggling to find a tree it is heat/cold tolerant, will not grow too big, and yet provide the year around shade. I am so afraid that I make a wrong decision, and only find it out much later. Your garden looks so beautiful. 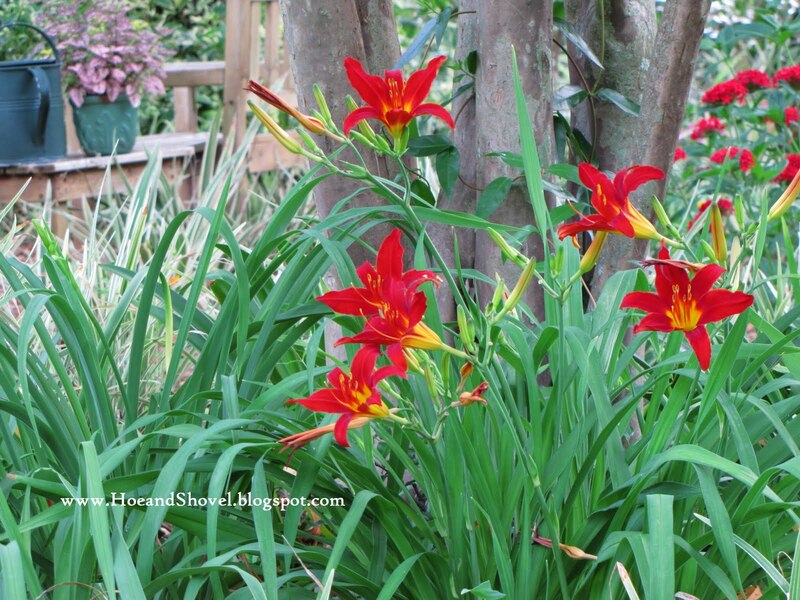 Love the daylily picture! Happy Mother's Day. I know how hard you work with two boys and a FT job... big hugs (and encouragement) for all you do! Yes, the crape will lose its leaves and I considered that a good thing in this situation. The softer/shorter winter sun is welcomed in this case because the live oaks protect what needs to be shaded back there. Making a tree-decision is a big deal. I understand your thinking because getting rid of one is sometimes much more trouble than folks realize. I love the functionality of the standard Ligustrum at the other end of that planting bed. It is a great small tree that provides shade under its canopy and out to about 15 feet around it. Heat/cold tolerant and the birds love it for cover. It blooms beautifully in the spring. Not sure if it works for your situation but it is one of my favorites. What a lovely Mother's Day you had. I love crepe myrtles. They do give nice filtered shade and have pretty lightly scented blooms. Your gardens and flowers are always a delight to see. Meems-I think the Crepe Myrtle was an outstanding choice! It's going to look super! Sounds like a great Mother's Day! Happy Mother's Day Meems! You have a lovely tree there. It is going to look so nice blooming together with your other tree. All your photos are lovely but I especially loved seeing those canna leaves. Such a great color. Glad you had a great Mother's Day! Aren't plants the best gift? You just go on remembering forever and ever. I struggle the same way when choosing a tree. (It's easier if husband just goes and does it for me.) I'm struggling right now with a choice for a single tree on the north side of the house, where shade is needed. My garden "strips" are so narrow that each tree is very, very special and important. Good choice on the 'Natchez' crapes. They are my fave crape, as they grow larger than most crapes and make a nice summer shade tree, plus they have a pretty, weepy form. I have to say I love canna flowers, though. Never would I cut those off! it's hard to believe that you would snip off anything flowering in your yard 'cause you don't like them? and especially your fave color, red?? i think they have a distinction to them, so proud & tall! i like the foliage, but the flower is complimentary to the plant. as a usual thing, i don't want to plant the cannas because they self-propagate so profusely, but yours are unique & beautiful! p.s. love the crape tree too! and the story of the oak trees. especially that one for Mr. Meems! Meems: Thanks for putting lots of thoughts for me to choose a right tree for my small narrow stripped garden (I seem have the same issue as what FloridaGirl has, although I think her garden might still be bigger than mine :). I will do more research on those two trees you mentioned. THANKS! Glad you had a wonderful Mother's Day. Great choice for a crepe myrtle. I was given a KO rose which has gone into a large container instead of the ground. I want it to be portable! Sounds like a wonderful Mother's Day gift. I didn't know crepe myrtle before moving to Fl. They have become one of my favorites. Their shade and the beauty of their flowers is a welcome addition to a garden. I was just given two from a friends garden. I'm afraid most of the roots were cut off when he dug them up but they seem to be doing Ok. I'm trying to leave one multi-stemmed but have tried to prune the other to a single stem. I'm watching to see how they go. I hope you also had a wonderful Mother's Day. I've come to appreciate the crapes a little more recently. They have so many unusual characteristics ~~ the bark, the light canaopy, the flowers... I hope this one will do just as I envision for this spot. Thanks for the vote of confidence. I'm really enjoying it ~~even at this height it softens the area just enough so I don't feel completely exposed. Smaller lots (and spaces) definitely increase the challenge for choosing a good, long-lived tree that will provide shade but won't overpower everything else in the garden/area. Specimen trees are usually the ticket. Good luck with your choice~ I know it isn't easy. 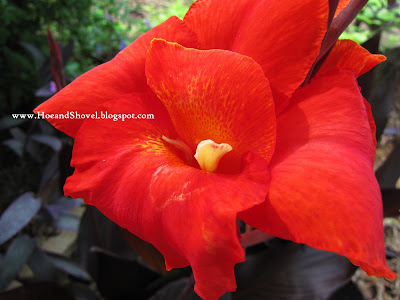 The flowers are ORANGE-red and somehow they distract from the luscious foliage ~~IMHO. 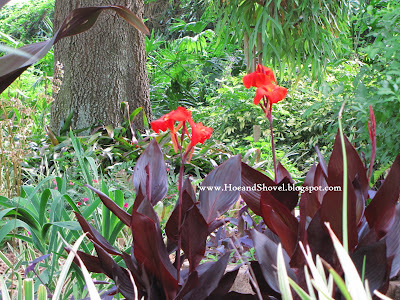 I've put in some other cannas this year with stripey foliage~~ also JUST for the foliage. You are welcome. Choosing a tree takes lots of thought. We have to envision the overall affects to everything else they will be around. So many people just plop a young one in the ground when its easy but then don't like them later and they are expensive to remove. It's good that you are taking time to consider all the factors. Right plant- right place... makes for a happy gardener and garden. Sometimes just a fast growing shrub-type will work in certain situations where you can limb-up the shrub to "look" like a tree. Good luck and I'll keep thinking too. A belated Happy Mother's Day to you. Congrats on the new Knock Out... I'm sure it is beautiful. One of my other purchases was a KO rose tree. Also single trunked. I put it in the ground not too far from the new crape as they overwinter well here. It is my first ever KO... the sunny spot from the tree removal made it possible. Such a nice gift for you, too. You've nothing to lose to try to limb one up. 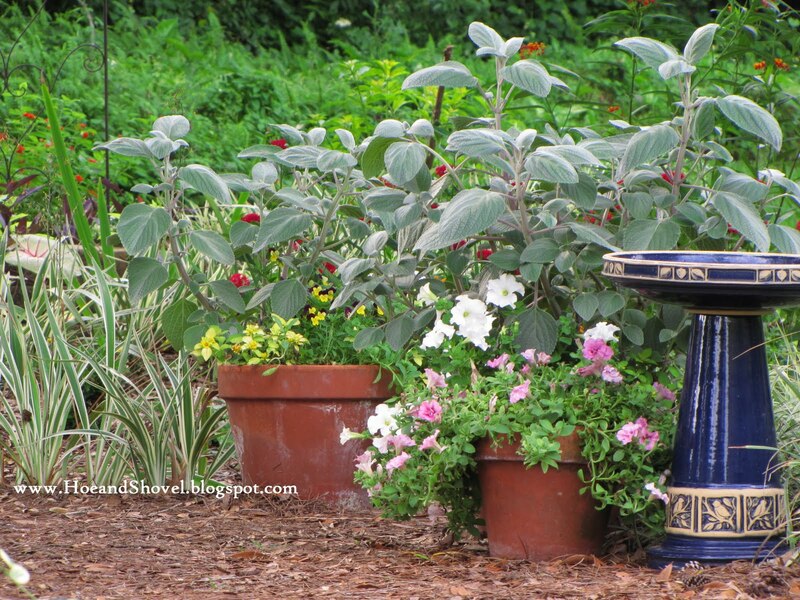 Plants can be amazingly resilient in Florida with our soil already warming up nicely and plenty of sunshine. I have a feeling if you keep the crepes watered well they will adjust and grow new roots from what was left on them. I can't seem to get my family on board with the garden-related gifts, darn it! I think it's because they live far from me, so even though I suggest garden center gift cards when they ask for ideas, they never materialize. I'll just have to spend my own money then! Just got back from central Florida where I visited the Leu Gardens in Orlando, and Discovery Garden in Tavares, and thought of your lovely garden somewhere nearby! Hi, Meems! I've been very slow at getting around to my favorite blogs, but I guess that's the way it's going to be during the warmer months. 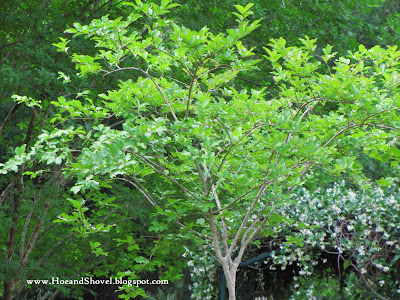 The crepe myrtle is a lovely choice...so pretty! It reminds me of a lilac, which doesn't grow down here. And your garden is spectacular! Meems - What a great entry. 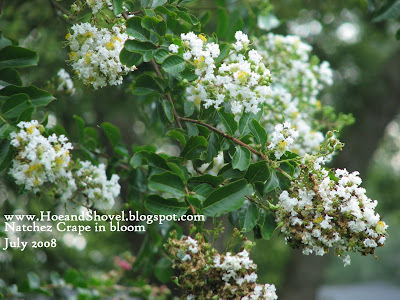 I envy all that can grow crape myrtle, I live vicariously through gardeners that plant them. Hi Meems...Great choice for a flowering tree and a Mother's Day gift. 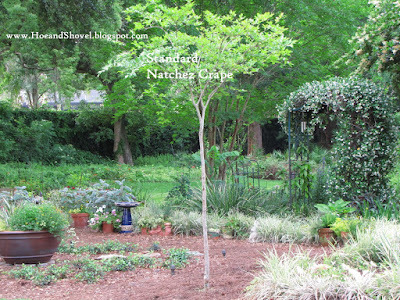 Natchez is one of my favorite crape's. The white flowers give me such a cool feeling in the midst of the summer heat. It looks like your circle garden is shaping up and filling in nicely. You were really in 'central' Florida at those two gardens. Each about 2 hours from Hoe and Shovel. I hope you enjoyed our beautiful state and visiting gardens is a wonderful way to spend vacation. There are so many trees we can't grow way down here. It's nice to have some 'easy' blooming ones. Happy (belated) Mother's Day to you, too. I do seem to gravitate towards white flowers... I'm with you on how cool they feel in summer. Also love the way they show up as the sun is setting. The Natchez is going to make a good understory tree I think (hope). Hope you had a wonderful Mother's Day Meems. It sounds like it was - any day that includes new plants is delightful! Your new crape myrtle is very pretty.